A combination motorbike race and gang brawl. Ensure victory by taking a chain or a baseball bat and knocking your opponents off their bikes. In this world, there's no such thing as gratuitous violence. 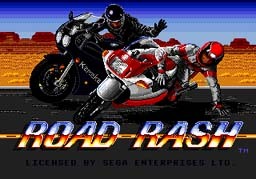 Road Rash was one of my favorite games on the Genesis. I never owned a copy, but a buddy of mine did. We used to play Road Rash until his parents would finally make us go outside and play. It was very addictive. What kept me going was the ability to win money and spend it on new bikes and what not. I also liked knocking people on the ground while going a hundred miles an hour by kicking, punching, or even hitting them with a chain or club you stole from them. They even had a life bar for each person so it wasn't that easy to knock em off. Sometimes you had to fight with them for a while before they would fall. You always have to be careful of the fuzz though. If you fall off your bike while a cop is near, he will bust you and charge you a rather hefty fine. This is a real bummer since you need that money to get better bikes. Road Rash is quite a fun game and I suggest you give it a try! 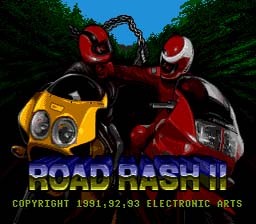 Road Rash II was almost exactly the same as Road Rash. The only differences I could see were the graphics were improved a little, and the bike shop was more intuitive. Other than that it was the same game. Which means to me that it was great! The same game with a little better graphics and more tracks to race makes a great sequel! If you liked Road Rash, give this second installment a try! Try taking the lead in every race. You must rank 3rd place or better to qualify . You must qualify on every track to move on to the next course, or level. On every race, you get paid a certain amount of money. The higher your rank in the end, the more cash you get. You can use this cash to upgrade your current bike, or to buy a new one. Hitting players can push your rank up, because you knock them behind. Punch, kick, and use a weapon to make another racer fall behind in the race. You can get weapons by stealing them from other racers. You must also watch out for cops. If you stop, you will get busted, and that will cost you some money. You will get busted if you simply stop or fall of your bike.